Rejuvenate tired eyes with First Aid Beauty's Eye Duty Triple Remedy AM Gel Cream; an energising formula that works to refresh, revitalise and restore youthful vitality. Fortified with a blend of Red Algae, Seaweed and Cucumber Extract, the powerful treatment absorbs quickly to minimise the appearance of fine lines and dark circles, whilst instantly hydrating and cooling the eye area for long-lasting comfort. 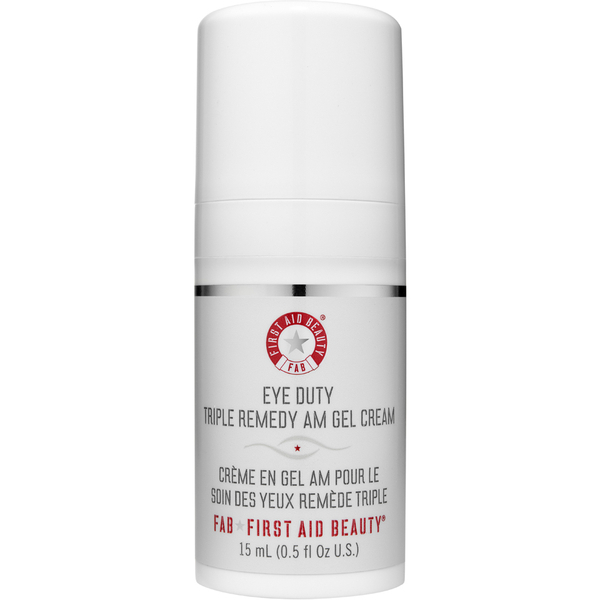 Eyes are left brighter and smoother with reduced puffiness. Apply to eye area in the morning before make-up application. May also be applied during the day to refresh tired eyes.